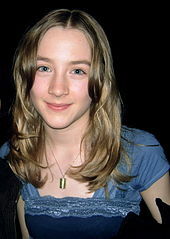 Saoirse Una Ronan (/ˈsɜːrʃə ˈuːnə ˈroʊnən/ SUR-shə; born 12 April 1994) is an Irish and American actress. She is the recipient of several accolades, including a Golden Globe Award, and has been nominated for three Academy Awards and four British Academy Film Awards. Ronan made her acting debut with the Irish medical drama series The Clinic in 2003 and made her film debut with a supporting role in the romantic comedy I Could Never Be Your Woman in 2007. Her breakthrough came with the part of a precocious teenager in Atonement (2007), for which she was nominated for the Academy Award for Best Supporting Actress. Ronan followed this with the starring roles of a murdered girl seeking closure in The Lovely Bones (2009), a teenaged assassin in Hanna (2011), a vampire in Byzantium (2012), and a baker in The Grand Budapest Hotel (2014). Ronan made her stage debut as Abigail Williams in the 2016 Broadway revival of The Crucible. ↑ "Saoirse Ronan". TV Guide. Archived from the original on 29 March 2017. Retrieved 28 March 2017. ↑ Jocelyn (28 March 2011). "Saoirse Ronan Talks Hanna (part 1)". Popbunker.net. Archived from the original on 23 June 2013. Retrieved 28 April 2011. ↑ O'Dowd, Niall (10 January 2018). "Saoirse Ronan's illegal Irish parents and her start in the Bronx". Irish Central. Archived from the original on 10 January 2018. ↑ Gilbey, Ryan (27 May 2013). "Saoirse Ronan – 200 years young". The Guardian. Archived from the original on 12 December 2017. 1 2 Brooks, Xan (23 January 2010). "Saoirse Ronan: A name to reckon with". The Guardian. Archived from the original on 11 August 2017. ↑ Byrne, Nicola (23 January 2018). "RTÉ shared a lovely video of Saoirse Ronan's Carlow classmates celebrating her first Oscar nomination". The Daily Edge. Archived from the original on 24 March 2018. Retrieved 23 March 2018. ↑ Fragoso, Samuel (13 November 2015). "Saoirse Ronan on growing up and moving to New York". Vice. Archived from the original on 29 November 2015. Retrieved 24 January 2016. ↑ "Irish Teen Saoirse Ronan Cast In Peter Jackson's 'The Lovely Bones'". Irish Film and Television Network. 12 July 2007. Archived from the original on 20 November 2007. ↑ Rodriguez, Karla (4 August 2011). "Saoirse Ronan admits disappointment over 'Harry Potter' Luna Lovegood role". IrishCentral. Archived from the original on 23 June 2013. ↑ Schwartz, Missy (8 February 2008). "Would You Dump This Woman?". Entertainment Weekly. Archived from the original on 23 June 2013. Retrieved 4 February 2010. ↑ "Atonement". The Numbers. Archived from the original on 23 June 2013. Retrieved 4 February 2010. ↑ Burr, Ty (7 December 2007). "The lies of others – A Wrongful Act Reverberates In The Sumptuous 'Atonement'". The Boston Globe. Archived from the original on 23 June 2013. Retrieved 4 February 2010. ↑ Christopher, Orr (7 December 2007). "The Movie Review: 'Atonement'". The Atlantic. Archived from the original on 15 December 2017. Retrieved 15 December 2017. ↑ Dirks, Tim (2013). "Academy Awards Best Supporting Actress Facts & Trivia". Filmsite.org. Archived from the original on 23 June 2013. Retrieved 22 June 2013. ↑ "Death Defying Acts (2007)". Rotten Tomatoes. Archived from the original on 22 August 2015. Retrieved 4 February 2010. ↑ "City of Ember (2008)". Rotten Tomatoes. Archived from the original on 31 August 2010. Retrieved 13 September 2010. ↑ Holden, Stephen (9 October 2008). "Fleeing a Dying Civilization, Toward Hope and Sunlight". The New York Times. Archived from the original on 15 December 2017. Retrieved 15 December 2017. ↑ Villarreal, Yvonne (10 December 2009). "Saoirse Ronan of 'The Lovely Bones' stays on balance". Los Angeles Times. Archived from the original on 23 June 2013. Retrieved 28 December 2009. 1 2 Schneller, Johanna (8 January 2010). "Saoirse Ronan: It's lonely playing a girl gone to heaven". The Globe and Mail. Archived from the original on 8 February 2018. Retrieved 15 December 2017. ↑ "The Lovely Bones (2009)". Rotten Tomatoes. Archived from the original on 24 December 2016. Retrieved 15 December 2017. ↑ Corliss, Richard (10 December 2009). "'The Lovely Bones': Dead Girl's Love Story". Time. Archived from the original on 23 June 2013. Retrieved 25 December 2009. ↑ Corliss, Richard (8 December 2009). "3.Saoirse Ronan as Susie Salmon in The Lovely Bones". Time. Archived from the original on 13 September 2017. Retrieved 11 July 2018. ↑ Sandhu, Sukhdev (17 February 2010). "The Lovely Bones, review". The Daily Telegraph. Archived from the original on 15 December 2017. Retrieved 15 December 2017. ↑ "Leading Actress in 2010". British Academy of Film and Television Arts. Archived from the original on 23 June 2013. Retrieved 22 June 2013. ↑ "'Avatar' dethroned at box office by 'Dear John'". Reuters. 7 February 2010. Archived from the original on 15 December 2017. Retrieved 15 December 2017. ↑ Muldoon, Molly (31 December 2010). "Big Oscar Hopes For Colin Farrell And Saoirse Ronan In 'The Way Back'". IrishCentral. Archived from the original on 23 June 2013. Retrieved 6 February 2011. ↑ Selby, Jenn (5 May 2011). "Interview: Saoirse Ronan". Glamour. Archived from the original on 8 February 2018. Retrieved 15 December 2017. ↑ "Hanna: Saoirse Ronan and Joe Wright interview". The Daily Telegraph. 5 May 2011. Archived from the original on 21 December 2017. Retrieved 15 December 2017. ↑ "Hanna (2011)". Rotten Tomatoes. Archived from the original on 28 May 2011. Retrieved 12 June 2011. ↑ "Hanna". Box Office Mojo. Archived from the original on 15 December 2017. Retrieved 15 December 2017. ↑ "Ghibli's 'Arrietty' to Have Different Dub Casts in US, UK". Anime News Network. 21 June 2011. Archived from the original on 20 January 2016. Retrieved 13 July 2011. ↑ Karger, Dave (25 June 2010). "Academy invites 135 new members". Entertainment Weekly. Archived from the original on 22 March 2016. Retrieved 25 January 2016. ↑ Goldman, Eric (6 June 2013). "Violet & Daisy Review". IGN. Archived from the original on 15 December 2017. Retrieved 15 December 2017. 1 2 Clarke, Cath (29 May 2013). "Saoirse Ronan: 'I could have ended up like Lindsay Lohan'". Time Out. Archived from the original on 15 December 2017. Retrieved 15 December 2017. ↑ Jones, Alan. "Byzantium". Radio Times. Archived from the original on 15 December 2017. Retrieved 15 December 2017. ↑ "The Host". Rotten Tomatoes. Archived from the original on 8 April 2013. Retrieved 31 March 2013. ↑ Dargis, Manohla (28 March 2016). "Fighting the Peacenik Alien Within Her". The New York Times. Archived from the original on 15 December 2017. Retrieved 15 December 2017. ↑ Richards, Olly (25 September 2013). "How I Live Now Review". Empire. Archived from the original on 15 December 2017. Retrieved 15 December 2017. ↑ "How I Live Now". Box Office Mojo. Archived from the original on 4 April 2014. Retrieved 4 April 2014. ↑ "Justin and the Knights of Valour (2013)". Rotten Tomatoes. Archived from the original on 22 April 2016. Retrieved 26 April 2015. ↑ "The Grand Budapest Hotel (2014)". Rotten Tomatoes. Archived from the original on 19 April 2015. Retrieved 26 April 2015. ↑ "Lost River (2015)". Rotten Tomatoes. Archived from the original on 26 April 2015. Retrieved 26 April 2015. ↑ "The 21st century's 100 greatest films". BBC. 23 August 2016. Archived from the original on 31 January 2017. Retrieved 8 November 2016. ↑ "The Grand Budapest Hotel". Box Office Mojo. Archived from the original on 6 August 2017. Retrieved 15 December 2017. ↑ "Lost River, film review: Ryan Gosling's directorial debut is a wildly self-indulgent affair". The Independent. 9 April 2015. Archived from the original on 15 December 2017. Retrieved 15 December 2017. ↑ Debruge, Peter (23 January 2015). "Sundance Film Review: 'Stockholm, Pennsylvania'". Variety. Archived from the original on 15 December 2017. Retrieved 15 December 2017. ↑ McGowan, Sharon (9 October 2015). "Saoirse Ronan's 'Brooklyn' role tipped to bring Hollywood honours". Irish Independent. Archived from the original on 24 January 2016. Retrieved 24 October 2014. ↑ Erbland, Kate (16 March 2016). "Saoirse Ronan on Why the Real Heart of Her Romantic Drama 'Brooklyn' Isn't What You'd Expect". IndieWire. Archived from the original on 15 December 2017. Retrieved 15 December 2017. ↑ "Brooklyn (2015)". Rotten Tomatoes. Archived from the original on 1 March 2016. Retrieved 1 March 2016. ↑ Bradshaw, Peter (5 November 2015). "Brooklyn review – Saoirse Ronan shines in a heartfelt and absorbing adaptation". The Guardian. Archived from the original on 14 October 2017. Retrieved 10 December 2017. ↑ Turan, Kenneth (3 November 2015). "Saoirse Ronan soars in the emotionally rich immigrant's tale 'Brooklyn'". Los Angeles Times. Archived from the original on 25 October 2017. Retrieved 10 December 2017. ↑ "Golden Globes nominations 2016: the full list". The Guardian. 10 December 2015. Archived from the original on 5 November 2017. Retrieved 15 December 2017. ↑ "Oscars 2016: full list of Academy Award nominations". The Guardian. 28 February 2016. Archived from the original on 21 October 2017. Retrieved 15 December 2017. ↑ Manly, Lorne (6 August 2015). "'Crucible' Revival, With Whishaw and Okonedo, Sets Broadway Opening". The New York Times. Archived from the original on 8 August 2015. ↑ Clement, Olivia (10 February 2016). "Crucible Star Saoirse Ronan Says She Was Never Pushed to Change Her Name". Playbill. Archived from the original on 6 July 2017. Retrieved 15 December 2017. ↑ Viagas, Robert (17 July 2016). "The Crucible Revival Ends Broadway Run". Playbill. Archived from the original on 23 October 2016. Retrieved 15 December 2017. ↑ Rothkopf, Joshua (16 February 2016). "Saoirse Ronan on Brooklyn, her stage debut, why moms know best and returning to New York". Time Out. Archived from the original on 15 December 2017. Retrieved 15 December 2017. ↑ Eliana, Dockterman (3 June 2016). "How Talent—and a Little Luck—Got Saoirse Ronan to Hollywood". Time. Archived from the original on 7 November 2017. Retrieved 15 December 2017. ↑ Rooney, David (31 March 2016). "'The Crucible': Theater Review". The Hollywood Reporter. Archived from the original on 10 December 2017. Retrieved 10 December 2017. ↑ Winer, Linda (30 March 2016). "'The Crucible' review: Ivo van Hove electrifies Arthur Miller". Newsday. Archived from the original on 10 December 2017. Retrieved 10 December 2017. ↑ Erbland, Kate (7 September 2017). "'On Chesil Beach' Review: A Breakout Turn From Billy Howle Can't Rescue This Cold Ian McEwan Adaptation". IndieWire. Archived from the original on 27 November 2017. Retrieved 14 December 2017. ↑ "'Lady Bird' sets Rotten Tomatoes record as best-reviewed movie of all time". Entertainment Weekly. 27 November 2017. Archived from the original on 1 December 2017. Retrieved 27 November 2017. ↑ Scott, A. O.; Morris, Wesley (7 December 2017). "The 10 Best Actors of the Year". The New York Times. Archived from the original on 7 December 2017. Retrieved 8 December 2017. ↑ Merry, Stephanie; Yahr, Emily (11 December 2017). "Golden Globes nominations 2018: Complete list of nominations". The Washington Post. Archived from the original on 11 December 2017. Retrieved 11 December 2017. ↑ Chavez, Danette (13 December 2017). "Big Little Lies and Three Billboards Outside Ebbing, Missouri lead 2018 SAG Awards nominees". The A.V. Club. Archived from the original on 14 December 2017. Retrieved 14 December 2017. ↑ Keveney, Bill. "'SNL' announces December hosts: Saoirse Ronan, James Franco, Kevin Hart". USA Today. Archived from the original on 10 December 2017. Retrieved 9 December 2017. ↑ Clarke, Donald (4 December 2017). "Saoirse Ronan's Saturday Night Live is unfunny paddywhackery". The Irish Times. Archived from the original on 6 December 2017. Retrieved 9 December 2017. ↑ Morgan Britton, Luke (4 December 2017). "Saoirse Ronan's 'SNL' sketch criticised for promoting Irish stereotypes". NME. Archived from the original on 10 December 2017. Retrieved 9 December 2017. ↑ Harrison, Ellie (4 May 2017). "Saoirse Ronan leads Irish stars in Ed Sheeran's Galway Girl video". Radio Times. Archived from the original on 8 March 2018. Retrieved 7 March 2018. ↑ McNary, Dave (24 October 2017). "Saoirse Ronan, Annette Bening's 'The Seagull' Flies to Sony Classics". Variety. Archived from the original on 31 December 2017. Retrieved 14 December 2017. ↑ O'Sullivan, Michael (16 May 2018). "Annette Bening and Saoirse Ronan deliver masterful performances in Chekhov's chilly 'The Seagull'". The Washington Post. Archived from the original on 30 June 2018. Retrieved 16 May 2018. ↑ Li, Shirley (8 December 2017). "Margot Robbie, Saoirse Ronan rule in Mary, Queen of Scots first look photos". Entertainment Weekly. Archived from the original on 15 December 2017. Retrieved 14 December 2017. ↑ Buchanan, Kyle (5 December 2018). "Saoirse Ronan and Margot Robbie Are Coming Into Their Power". The New York Times. Retrieved 7 December 2018. ↑ "'Mary Queen of Scots': Film Review". The Hollywood Reporter. 15 November 2018. Retrieved 15 November 2018. ↑ "Mary Queen of Scots review – Saoirse Ronan rules over political drama". The Guardian. 16 November 2018. Retrieved 16 November 2018. ↑ "Emma Watson in Talks to Join Meryl Streep in 'Little Women'". The Hollywood Reporter. Archived from the original on 26 August 2018. Retrieved 26 August 2018. ↑ Whipp, Glenn (5 July 2018). "Why it's a perfect time for Greta Gerwig's version of 'Little Women'". Los Angeles Times. Archived from the original on 5 July 2018. Retrieved 6 July 2018. ↑ Mary Queen of Scots': Saorise Ronan and Josie Rourke on the 'cost of power'. Gold Derby. 22 December 2018. Retrieved 23 December 2018. ↑ Wiseman, Andreas (14 December 2018). "Kate Winslet & Saoirse Ronan To Star In Romance 'Ammonite' For 'The King's Speech' & 'Lady Macbeth' Producers". Deadline Hollywood. Retrieved 15 December 2018. ↑ Garratt, Sheryl (24 October 2015). "Saoirse Ronan on how Brooklyn is her own Irish-American journey". The Daily Telegraph. Archived from the original on 27 May 2016. Retrieved 20 June 2016. ↑ Vancheri, Barbara (7 January 2016). "Like her character, Saoirse Ronan has Irish, American connections". Duluth News Tribune. Retrieved 16 December 2017. ↑ Coyle, Colin (14 January 2018). "From Golden Globes to Greystones for Saoirse Ronan". The Times. ↑ "Saoirse Ronan". Forbes. Archived from the original on 17 July 2018. Retrieved 17 July 2018. ↑ Dockterman, Eliana (3 June 2016). "Saoirse Ronan: Next Generation Leaders". Time. Archived from the original on 7 June 2016. Retrieved 10 June 2018. ↑ "Meet the Women of the Maxim Hot 100". Maxim. 14 June 2018. Archived from the original on 18 June 2018. Retrieved 3 July 2018. ↑ "The Best American Actors Under 30". IndieWire. 2 July 2018. Archived from the original on 3 July 2018. Retrieved 3 July 2018. ↑ Rooney, Sally (11 July 2018). "Saoirse Ronan on Growing Up on Camera, the Changing Politics of Ireland, and Becoming a Queen". Vogue. Archived from the original on 11 July 2018. Retrieved 11 July 2018. ↑ Sherman, Lauren. "Calvin Klein and Raf Simons Launch New Fragrance". Business of Fashion. Retrieved 16 July 2018.